One of his clients said: "	Dad, husband, practice owner, triathlete, life saver and vet. I own two practices (in partnership) in WA: 9 vets, 12 nurses. We do everything from vaccinations to chemotherapy, local referral procedures and our own after-hours. Regional work at it's best. 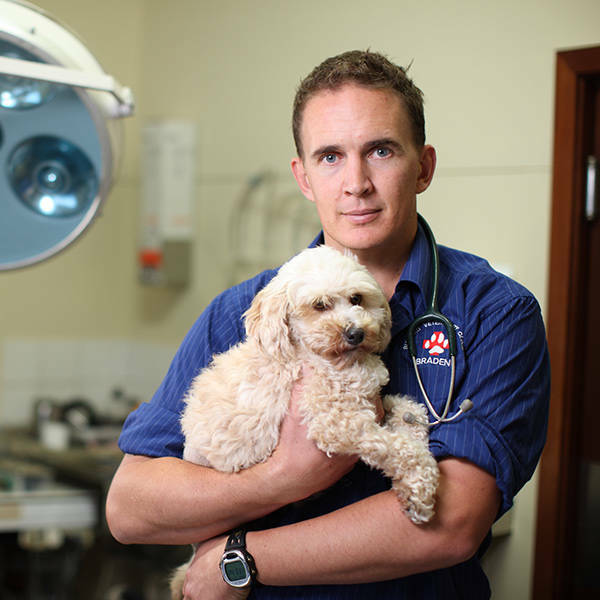 Dr Braden: Bunbury Vet - the new Bondi Vet"
A few years Braden saw our then puppy Elsie for a bite on her mouth....he is a talented surgeon as well...he saved her tooth n she has never had any issues since. He is honest, firm n passionate about pets n doesn't "beat about the bush"....thanks! Braden is hands down the best vet I have been to with my Chihuahua, Dolly throughout 3 states. I don't live in WA any more, but I still follow Braden's work and admire the passion and commitment he has for all his patients. Definitely a worthy Bondi vet. Braden provided care for my golden retriver when he needed urgent surgery for abdominal masses. He and his colleagues were brilliant and provided care to Arnie, my husband and I during Arnie's illnes. He was realistic about options and helped us to make the right choices for Arnie. Dr Braden personally helped bring our family dog back to life after being in a dog fight. The care that was given during the drama. But also after was amazing. Braden and the team were absolutely amazing with our girl who was diagnosed with Lymphoma, even though she went to the vets every week she still loved going and getting smothered with hugs and kisses. She felt right at home there and loved to wait for Braden on the chairs!! Braden is very dedicated and passionate about ensuring the best possible care for his patients. The clients love him. Couldn't think of any one more suited to the job! Braden and his team at the Bunbury Clinic are amazing. I won't trust anyone else with my mini zoo ❤️ It would be so cool to see the team on TV!